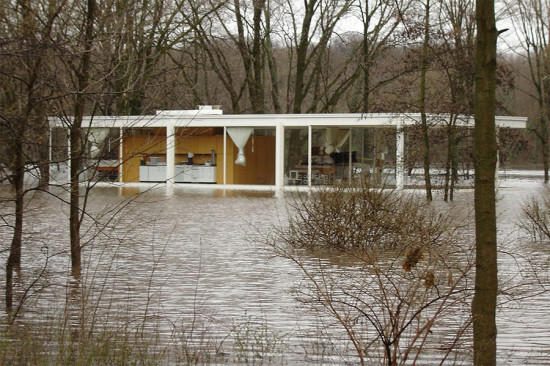 Ludwig Mies van der Rohe’s archetypal modernist home, the Farnsworth House, is drowning. The banks of the Fox River served as an idyllic setting for the building’s white steel and glass when it landed in Plano, Illinois. But lately the Fox has gone rabid, spilling over its banks three times in the past 18 years. So what to do? Preservationists are looking at installing hydraulic jacks to lift the house during floods, to the tune of about $3 million. Call it the Three Million Dollar Modernist. Ironically Mies put the house on stilts to prevent such flooding; I guess you can’t outwit a wily Fox.